Source: CICH graphic created using data adapted from Statistics Canada. Table 153-0148 – Households and the environment survey, parks and green spaces, Canada, provinces and census metropolitan areas (CMA). http://www5.statcan.gc.ca/cansim/a26;jsessionid=107BA08D2BAA4D46B2F73BA33D821ABE?lang=eng&retrLang=eng&id=1530148&tabMode=dataTable&srchLan=-1&p1=-1&p2=9 – accessed May 21, 2017. 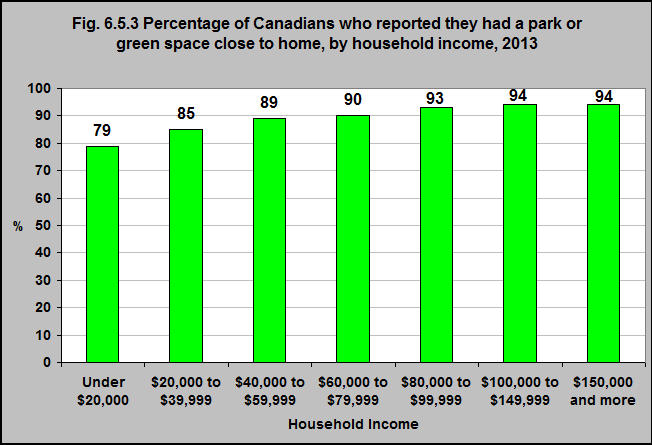 In 2013, Canadians living in lower income households were less likely to live near a park or a green space. 79% of households whose income was less than $20,000 reported they lived close to a park or green space in comparison to 94% of households with incomes of $100,000 or more. 94% of households with incomes of $100,000 or more reported they had a park or green space close to home.